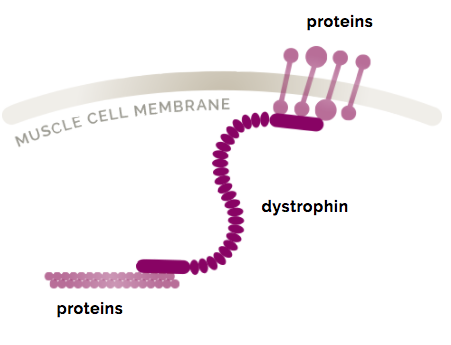 The dystrophin protein is needed for muscles to function properly, and is missing or found in very small amounts in people with Duchenne. Let’s learn more about this important protein. Proteins are the building blocks for almost all the tissues in the body, and are essential for our bodies to function. Each protein has a specific job, for instance, helping you digest food, helping your hair and nails grow, or helping you fight off infection. 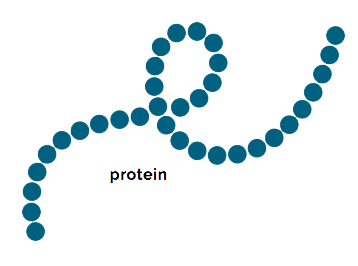 To make proteins, the body needs instructions so it knows which proteins to make and how to make them. These instructions are found in sections of our DNA called genes. Dystrophin is a protein found in muscle cells. It is one of a group of proteins that work together to strengthen muscle fibers and protect them from injury as muscles contract and relax. 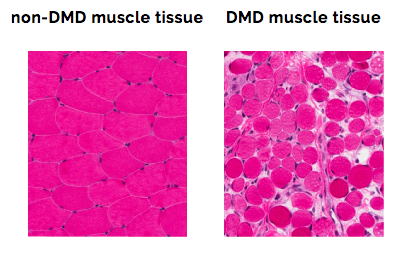 Duchenne is caused by mutations to the dystrophin gene. Most commonly, one or more exons (a portion of the gene) are missing, and the remaining exons don’t fit together properly. Because of this error in the genetic instructions, cells cannot make dystrophin, a protein muscles need to work properly. Without dystrophin, muscle cells are damaged, and, over time, are replaced with scar tissue and fat in a process called fibrosis. How can we tell if the body is making dystrophin? Researchers have developed various tests that can be used to identify, locate, and measure dystrophin.